The relationship between sport, medicine and health in our society is becoming increasingly complex. This important and timely study explores this relationship through an analysis of changing political economies, altered perceptions of the body and science’s developing contribution to the human condition. Surveying the various ways in which medicine interacts with the world of sport, it examines the changing practices and purposes of sports medicine today. Drawing on the latest research in the sociology of sport, this book investigates the scientific discourse underlying the promotion of physical activity to reveal the political context in which medical knowledge and public policies emerge. It considers the incongruities between these policies and their attempts to regulate the supply of and demand for sports medicine. 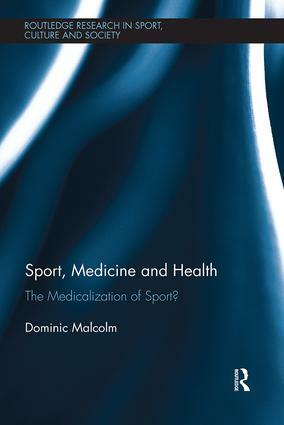 Through a series of original case studies, this book exposes the social construction of sports medical knowledge and questions the potential for medicine to influence athletes’ well-being both positively and negatively. Sport, Medicine and Health: The medicalization of sport? provides valuable insights for all students and scholars interested in sports medicine, sports policy, public health and the sociology of sport. Conclusion: the medicalization of sport?